One of the more difficult and certainly confusing aspects of the Elliott Wave Theory involves the nebulous complex corrections and X Waves. A beginner with the wave theory will certainly spend a lot of time trying to understand X waves. To add to the complication they will undoubtedly follow other Elliotticians and not understand why what appeared to be a normal correction was labeled as a WXY or WXYXZ. We are going to try to take the mystery out of this issue for you. When wave A consists of 3 waves, but wave B does not reach a 90% retracement of A. You can not properly identify the structure as a flat or a zigzag. Potentially it could work as a triangle, but without a really complex C wave or a D wave you can't really label it as a triangle either. It should tentatively be labeled as an X wave. Following an A,B,C retracement, the price starts what is expected to be wave 3 (or wave 5), but pivots and reverses before reaching the pivot of wave 1 (or 3). Label it as an X wave. (Note it can't be an extension forming (another 1-2), as that would penetrate the pivot before reversing. There are some trip-offs that complex correction may be occurring. 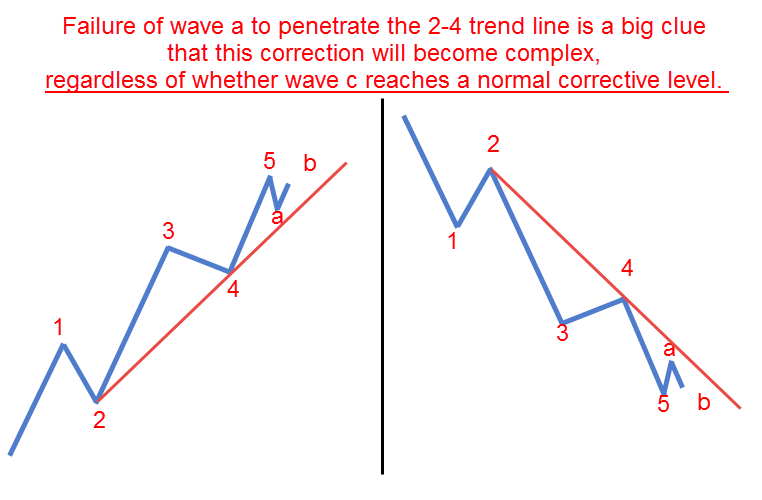 When wave A fails to penetrate a trend line drawn between wave 2 and 4 of the previous impulse wave, there is a better than average chance you will have a complex correction form, no matter whether wave c drops to a normal level thereafter. When the A,B,C retracement looks complete, but has not achieved a minimal Fibonacci retracement level.